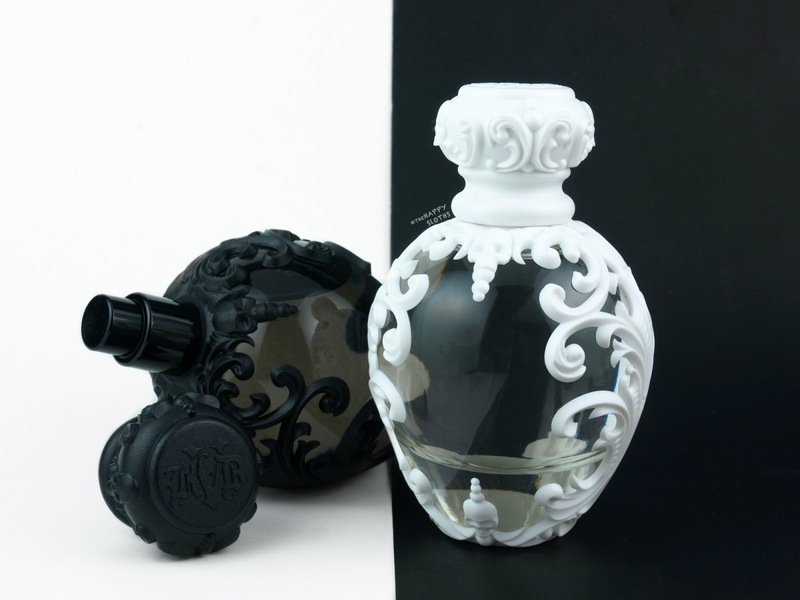 One white and one black, Saint and Sinner are both housed in bulb-shaped glass bottles enveloped in patterns of three-dimensional filigree details personally designed by Kat Von D. From the promotional images, the bottles looked bit cheap and toy-like but in person, they actually feel very modern and well-made. 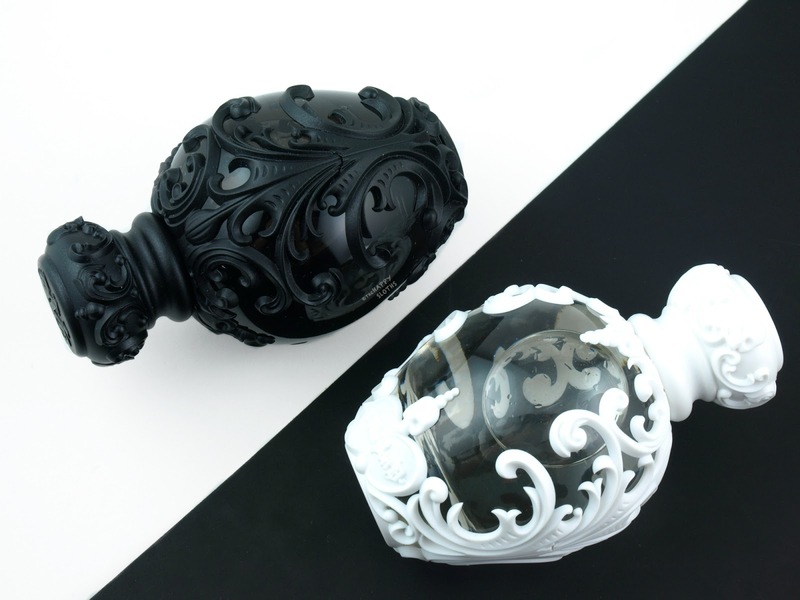 The gothic design is super unique and unlike any other perfume bottle I've seen. If you are big on displaying your fragrance collection on your vanity, these will make the perfect addition. 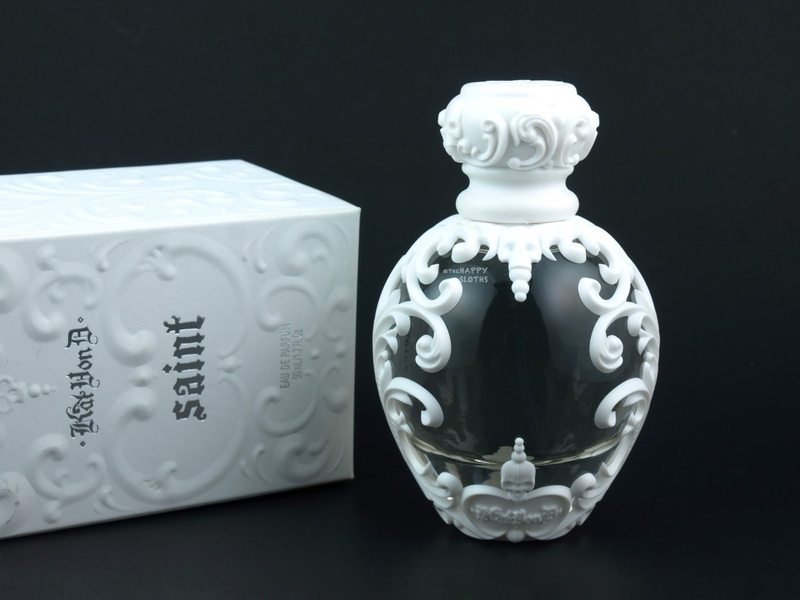 Opening with a quick whiff of tart plum, Saint is described as a gourmand floral. To my nose, the fragrance is pretty heavy on the floral notes and it's definitely made for those that like a very sweet, candy floral. I don't really detect much vanilla or sandalwood as the fragrance fades relatively quickly. Overall, this is a nice, all-season sweet floral but it's nothing mind-blowing. The bottle definitely sets it apart from all the other sweet floral fragrances on the market but the actual scent is nothing special. Top Notes: Mandarin orange, mirabelle plum. Heart Notes: Jasmine, tiare flower. Base Notes: Caramel, vanilla, sandalwood, musk. Sharing similar notes of mirabelle plum and jasmine, Sinner is a warmer, spicier version of Saint. The scent is still what I would describe as a sweet floral, but with a less gourmand, candy-like quality. The patchouli is not very strong here so if you aren't a fan of that pungent, earthy smell, Sinner definitely passes the test. Again, the wear is a bit lackluster as the scent fades away quite quickly. I'd say that if you were to only pick up one of the two, Sinner is the better choice because it has a more well-rounded scent profile that's sweet but nuanced. Base Notes: Vanilla, cinnamon, vetiver, patchouli, wood.